Today’s commercially available tactical vests are the direct descendants of the Modular Tactical Vest (MTV) adopted by the army just over a decade ago. Tactical vests are popular today with everyone from law enforcement personnel to hunters, survivalists, preppers, airsoft gamers and more. And they run the gamut from fairly simple rigs that hold your flashlight and powerbar to full-on professional-grade SWAT tactical gear. The fact is, there are a lot of tactical vests on the market today so finding one that’s perfect for your particular needs can be something of a challenge. That’s where we come in. We’ve done the homework for you, looked at hundreds of these vests, and chosen 10 that represent what we feel are the best tactical vests on the market today. Let’s get started. The UTG 547 Law Enforcement Tactical Vest is another serious vest that will attract plenty of professional attention while also catching the eye of some of the more dedicated airsoft gamers. This is a one size fits all tactical vest that’s loaded with practical pouches, pockets and compartments of every shape and size. There’s a universal cross-draw holster for your sidearm, 4 rifle mag pouches, half a dozen loops for shotgun shells, a pouch for a good sized survival knife, D loops for whatever you feel like hanging from a carabiner and a durable, breathable nylon mesh foundation underpinning the whole thing. Inside there are zippered pockets for important documents, maps and arrest warrants and the right shoulder is padded to absorb recoil from your rifle. Whatever you want in a serious tactical vest you’re going to find it here. We’re going to start off with a serious tactical vest; the Yakeda Tactical CS Field Vest. The vest itself is extremely light, has a foundation of durable nylon mesh, a high-performance zipper down the center and pockets and compartments to hold everything from your hunting GPS to your Glock. There’s a pistol belt at the very bottom the helps you secure this combat vest to your torso, 3 pistol mag pouches, a large pouch for carrying shells and a flip pocket for your first aid essentials. Somehow the whole thing manages to stay flexible and never feels unwieldy even when it’s stuffed to the gills. There’s also a pocket to hold a medium-sized hydration pack and a built-in feed tube for that hydration pocket. 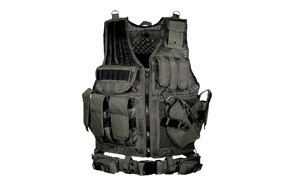 All in all a serious tactical vest for the military, law enforcement, and security professionals. The designers of the Barbarians MOLLE Tactical Vest have done their homework and started off on the right foot with durable, tear resistant, water resistant 600D polyester on the pockets and pouches all resting on a foundation of breathable nylon mesh. The Barbarians Tactical MOLLE Vest blurs the line between combat and game ready and no one is going to mind. There are 3 rifle mag pouches, a radio pouch, several pouches for your smaller tech like GPS, multi-tool and tactical flashlight and document pockets inside where they’re safe and dry. With generous MOLLE webbing throughout you’ll be able to attach everything but the kitchen sink (and they might have a pouch for that too) and the padded right shoulder will protect you from recoil. The vest can be held in close by way of long Velcro strips on the shoulder and at the waist and you don’t have to worry about the high-performance zippers rusting in the rain. The Gloryfire Tactical vest is one of those fairly simple rigs we mentioned at the start that’s light on the ammo pouches but heavy on the MOLLE loops and webbing. It features anti-slip shoulder pad a padded lining for extra comfort, a pocketed cummerbund and a large map pocket on the front with a snap closure that will hold your search warrant, arrest warrant and your list of things to pick up at the grocery store on the way home. The Gloryfire Tactical Vest is intended to be a base on which you attach modular components so there’s no need to discuss what it doesn’t have. The final configuration will be up to you. Comes with side release buckles, an adjustable waist strap and a 2-year warranty on materials and workmanship. 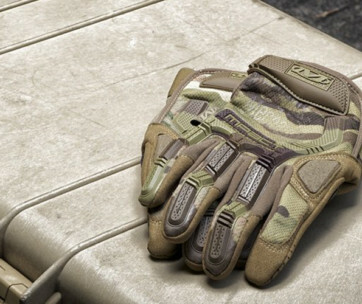 You can combine it with one of the tactical pants from our list. The GZ Xinxing Tactical Combat Vest is a slightly more robust version of the tactical vests profiled above. It has adjustable shoulder strips with Velcro closures along with tension straps along the sides to pull it in for a snug fit. Because of this adjustability, it will fit anyone of average height who wears shirt size S to XXL. Like all the best tactical vests it’s built on a foundation of tough nylon mesh that provides flexibility and first-rate ventilation. At the bottom there are a series of loops through which you can thread a gun belt and all across the chest area are enough flip-top pouches to satisfy any SWAT member or diehard airsoft enthusiast. Hunters, mountain rescuers, private security professionals and more will appreciate the versatility of the GZ Xinxing tactical combat vest. With a classic cross draw holster, myriad ammo pouches, pockets for your tech items, pepper spray, stun gun, emergency radio, shotgun shells and more the Barska VX-200 Tactical Vest is ready for whatever threat presents itself. It has a padded shoulder, a detachable pistol vest, lots of MOLLE webbing and straps and the whole thing is fashioned from uber-durable, water-resistant 1680D polyester. It’s a lightweight, versatile, dependable tactical vest that’s built to last and takes all contingencies into consideration. Whether you’re stalking elk through the high country or stalking your paintball foe through the obstacle course the Barska VX-200 has you covered. It also has inner pockets to keep important documents safe and it adjusts down to fit nice and snug, regardless of your size. This tactical military vest will cost you a little more but the high-quality materials make it worth the stretch. The Condor Recon Chest Rig is a change of pace that is something short of a full tactical vest but definitely something more than Batman’s utility belt. It has a full complement of kangaroo style pouches for your rifle, sidearm and airsoft mags, lots and lots of MOLLE webbing and, before we forget, those mag pouches can be repurposed to hold your survival knife, tactical flashlight, multi-tool or whatever else you need to bring along. The padded shoulder straps can be adjusted to fit any height and almost any girth and the swivel push release buckles are good for a nice firm hold every time. While some law enforcement or security pros may want something with more carry options this bare bones tactical vest chest rig will do most airsoft types just fine. The Lancer Tactical Chest Rig falls somewhere between the full-service tactical vests like the Xinxing and the Condor Recon Chest Rig we just reviewed. It may be the most clearly modular of the tactical vests on this list with tons of MOLLE straps and webbing and a half dozen detachable flip top pouches with Velcro closures. It’s an easy to wear hybrid rig made of high quality 600D polyester. It’s water resistant, tear resistant and can accommodate a water bladder of up to 2 ½ liters. Attach as many or as few MOLLE pouches as you like on either the front or the back and tighten everything down via adjustable shoulder and side straps. If you like you can remove the back panel altogether and embrace more of a classic chest rig design. Smartstandard Tactical Vest is a true modular MTV style tactical vest that provides you incredible flexibility in how you organize your gear and is ideal for airsoft aficionados and paintball warriors. It’s a light tactical vest that’s universally sized, fully adjustable and made of tough, tear and water resistant 1000D polyester fabric on a foundation of nylon webbing. Stitching throughout is of the highest quality and the various pouches and pockets affix easily and stay where you put them. The Smartstandard vest makes generous use of Velcro and there’s a top handle on the back plate for easy transport. If you need to get out of your MOLLE vest in a hurry there’s also an innovative quick release system. Whether you’re a member of the SWAT team or an Army Ranger setting out for parts unknown you’ll appreciate the high-quality construction and versatility of this tactical vest. 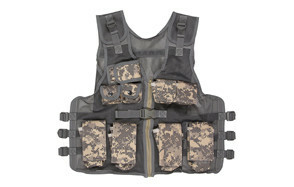 The last tactical vest on our list comes to us from Modern Warrior. This tactical vest has been reduced to the bare essentials of a nylon webbing foundation vest and tough, ripstop polyester MOLLE pouches and pockets that can be moved about with ease. It’s an entry-level tactical vest – about that there can be little doubt – but it’s also a great value for beginners or more seasoned pros who don’t need or want a full-scale tactical vest. Don’t let the fact that it’s been reduced to the basics fool you though. It’s as tough and practical as they come and one of the more fully adjustable tactical vests on the market today. Not necessarily intended for those carrying firearms. People have a lot of questions about tactical vests and below we’ll try and address their major areas of interest/concern. Q: What Can Tactical Vests Be Used For? A: Tactical vests are popular today among airsoft and paintball enthusiasts, hunters and rescuers but they’re also compulsory equipment for many military and security professionals. Because they’re so versatile they lend themselves to both combat and leisure activities with most capable of accommodating both a high powered sidearm and/or paintball mags, water bottles, your cell phone, a stun gun, powerbars, magazines for your Baretta and much more. So the short answer to the question is that they can be used for any type of activity you have in mind where you think you could benefit from bringing tactical accessories along, either for fun or self-defense. Q: What To Look For In A Tactical Vest? Weight - This is a tactical vest after all. That means it should allow you as much freedom of movement as possible while providing a platform for you to store needed tactical gear. If the vest is too heavy it’s not going to do its job very well and will instead bog you down. If we’re talking body armor that’s an entirely different discussion where safety trumps weight concerns. Pockets, pouches and more - Only you know how many and what type of gear you plan on carrying with your tactical vest but you’ll need to accommodate all of it. So before you begin shopping make sure you draw up a list of all the things you’ll need that vest to hold. Will you need it to carry a firearm or airsoft gun? Will you need it to carry ammo mags? A radio? A hunting knife? Make sure your list takes everything into account. Comfort - The tactical vest is an item of clothing and as such it should not only be lightweight, it should be comfortable as well, and easy to put on and take off. It’s unrealistic to think even the best tac vest is going to keep you warm in the winter but it’s not unrealistic to think you should be able to wear a sweater under it. Make sure the tactical vest can be easily fastened down so that you get a nice snug fit because nothing is worse than having your military gear flopping around while you’re trying to operate. While the tactical vest may not be able to keep you warm it should have plenty of ventilation so that it doesn’t cause you to overheat in the summer. Looks - While you’re not participating in a fashion show when you head out with your tactical vest on it should nonetheless be task-appropriate. Duck hunters are going to want a tan colored vest or perhaps one with a camo finish. SWAT teams will be looking for basic black as will most security pros. Military types will need to consider the mission before choosing a look for their vest. Q: How To Properly Put On A Tactical Vest? A: We mentioned above that a tactical vest should be comfortable and that you should be able to put it on and take it off easily. But just what is the right way to do that? Some tactical vests and chest rigs will slip on over your head. While others – including most of the vests on our list – can be put on like a button down shirt one arm at a time and then zipped closed. Once the vest is in place you’re going to use the shoulder adjustment straps to get it to hang correctly. You don’t want it hanging way down on your torso. If yours has a gun holster you can check the hang by checking the logistics of removing your weapon. If your tactical assault vest is hung properly the motion of removing your sidearm should be completely natural and effortless. Once your vest is hanging correctly use the side straps to pull it in snug to your body. “Snug” is the operative word here. But not so tight that it will constrict your movements. The number and type items you carry on your tactical vest will be driven by the mission of course but the following are a number of things most professionals and airsoft/paintball enthusiasts will take along. Tactical flashlight - Military personnel, police, SWAT team members and rescuers will want to have a high powered LED tactical flashlight with them at all times. It will not only bring light to bear on the scene it can be used for self-defense as well. You’ll want to avoid any flashlight that uses those monstrous D cell batteries and you’ll want to be sure the flashlight will fit comfortably into one of the pouches on your tactical combat vest. You may also want to consider bringing some light sticks for tight spots. They’re easy to stuff into a pouch and are light and inexpensive. A firestarter - Hunters will want to make sure they bring along a firestarter. If your pursuit takes you to unexpected places and you find you’re not going to make it back to camp you’ll need some method of getting a fire going. Disposable lighters are an inexpensive choice as are waterproof matches. There are also a number of kits on the market that are compact and provide everything you need to get a fire going. Multi-tool - Military personnel, rescuers, police, security professionals as well as hunters can’t lose by finding room for a good multi-tool. They provide you insurance for dealing with the unexpected which, since it’s unexpected, can be nearly impossible to plan for. Your best course of action is to have a piece of civilian tactical gear with you that will allow you to deal with as many potential scenarios as possible. And a multi-tool (and to a lesser extent a Swiss Army Knife) is just the thing. Emergency food - You can’t go wrong by bringing along some emergency sustenance. It doesn’t have to be a pork chop and baked potato. It could be a few powerbars or maybe some military rations, a packet or two of dried noodles or some hard candy. It doesn’t hurt to bring along a water bladder either since man does not live by bread alone. Navigational device - If you’re heading out in pursuit of game or the enemy you’ll want to have a good hunting GPS or similar device with you in case you lose the path. Even the best GPS device is dependent on an external power source however so there’s no substitute for having a first rate compass in one of your pouches as well as a topo map of where you’re going. First aid kit - First aid kits come in all shapes and sizes these days and you’re sure to find one that will fit into one of your MOLLE pouches. It doesn’t have to be a hospital in a box, just some bandages, Band-Aids, Tylenol, eye drops and any prescription medications you need. Misc items - Zip ties are great to have for about a hundred different reasons. Dust masks can save your bacon in a sandstorm and fold up to fit into just about any pouch. A space blanket weighs almost nothing, takes up virtually no space and can be an invaluable survival tool. 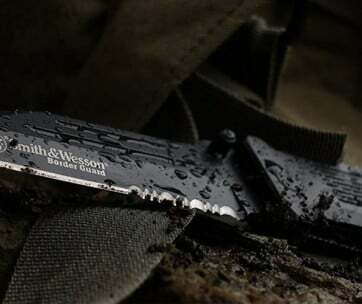 A decent bushcraft knife is also a must if you’re heading into unknown territory and if there’s room try and cram in a small roll of duct tape. That may seem like quite a load but it’s really not. You’d be amazed at how much you can comfortably carry if you’re smart about what you bring and how you pack. Just make sure your MOLLE gear load is mission specific. The best tactical vests enable you to be your best whether that’s on a paintball course or in the deserts of Afghanistan. 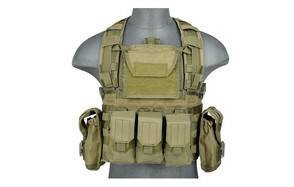 The key is to find the right MOLLE tactical vest for your specific needs. We hope you found the above reviews and buyer’s information helpful and make sure to stop back often for more product reviews and comparisons from Gear Hungry.